President A.P.J. 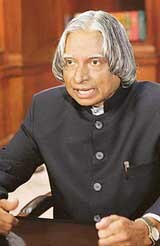 Abdul Kalam today exhorted all political parties to perform in an environment of developmental politics by competing with each other and putting forth their focussed developmental vision through their manifestoes. Are pitches in Pakistan responsible for making cricket a dull affair? Mr Gopal Krishan Kashyap, a Congress worker and president, Rajiv Gandhi Prantha Rehri Union, Patiala, who set himself on fire in full public view near the local bus stand yesterday to lodge his protest against alleged high-handedness of the Mayor, Municipal Corporation, Mr Vishnu Sharma, and the Adviser to the Chief Minister, Mr Bharat Inder Singh Chahal, died due to cardiac arrest at the local Rajindra Hospital today. An infuriated jawan of the Central Reserve Police Force (CRPF) shot dead four of his colleagues and critically injured another when he opened fire from his automatic weapon inside a camp here this afternoon. Elsewhere at least six militants were killed in separate incidents of violence in Jammu and Kashmir since yesterday. In a daylight shootout, members of one family fired indiscriminately and injured 13 persons, some critically, over a land dispute. The injured include Bahujan Samaj Party’s state General Secretary, Mr Amrik Singh, his sons and a nephew. 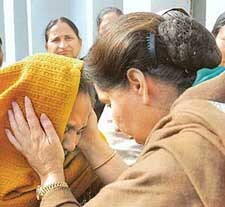 The BSP leader and four others with gunshot wounds have been brought to Chandigarh and have undergone complicated surgeries. All offices of The Tribune will remain closed today on account of Republic Day. There will, therefore, be no update of the site on Friday. The visiting King of Saudi Arabia Abdullah Bin Abdulaziz Al Saud today held 45-minute-long one-to-one talks with Prime Minister Manmohan Singh during which the two leaders are understood to have discussed the need for hammering out a strategy to keep a tab on the movement of terrorists and to block the availability of liberal funds to these groups. In the wake of the Supreme Court verdict on Bihar having “long-term implications for Constitutional propriety, political morality and democratic accountability”, the NDA leaders today asked President A.P.J Abdul Kalam to secure Prime Minister Manmohan Singh’s resignation and dismiss Governor Buta Singh before the Republic Day tomorrow. Veteran Malayalam film-maker and Dada Saheb Phalke Award winner Adoor Gopalakrishnan, teenage tennis sensation Sania Mirza, Infosys number two Nadan Nilekani, Gandhian Nirmala Deshpande and eminent cardiologist Uprendra Kaul were among 106 personalities from various fields chosen for prestigious Padma awards this year. His body lies in everlasting peace at 8150 m in the lap of mountains he so loved, claimed by the kiss of death after a unique climbing success for which he was today honoured with a Vayu Sena Medal for gallantry on the eve of the 57th Republic Day. Sqn Ldr S.S. Chaitanya, or “Chaithu” as he was popularly known, was among the first three of IAF men to climb the world’s tallest peak last year. Our 550 million youth, who are below 25 years of age should see an imprint of great leaders in every action of Members of Parliament.